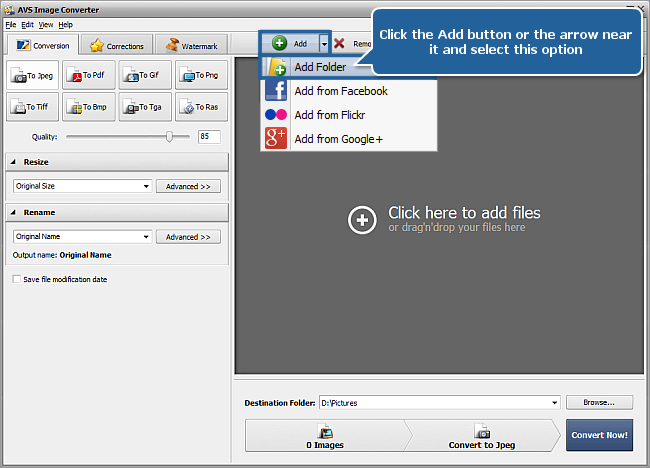 If you want to join a series of photos into an electronic booklet or you need to prepare them for printing, sending via e-mail or web publishing you can convert them to the Portable Document Format (PDF) because PDF documents are universally accessible and they can be viewed and printed on any computer regardless of operating system or printing device. 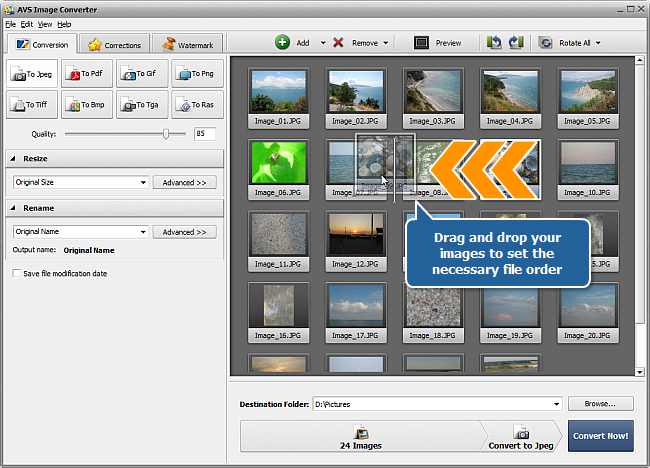 With the help of AVS Image Converter you can perform this task without any difficulties. Please follow the steps listed below. If you plan to save all the images to a single document, you need to set the necessary order of your images. You can perform this task within the Preview Area when the Thumbnails mode is activated. Click the image which is required to be moved and then drag and drop it to the desired position. 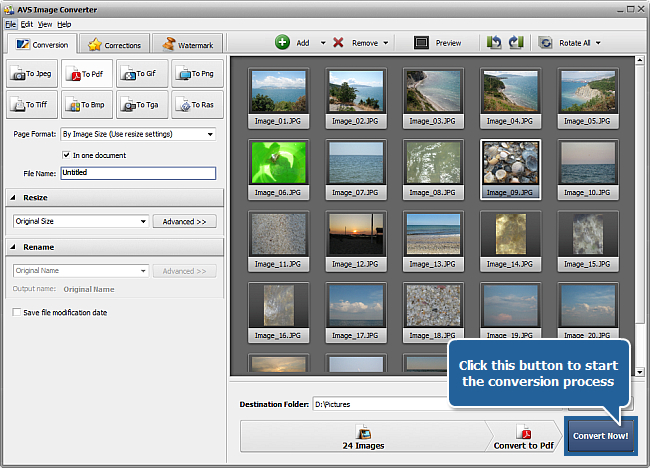 Press the To Pdf button on the Conversion tab to set the output image format. Pay attention to the opened Pdf settings located under the format buttons. Select the needed Page Format from the appropriate drop-down list. You can select one of the standard presets or the By Image Size option. 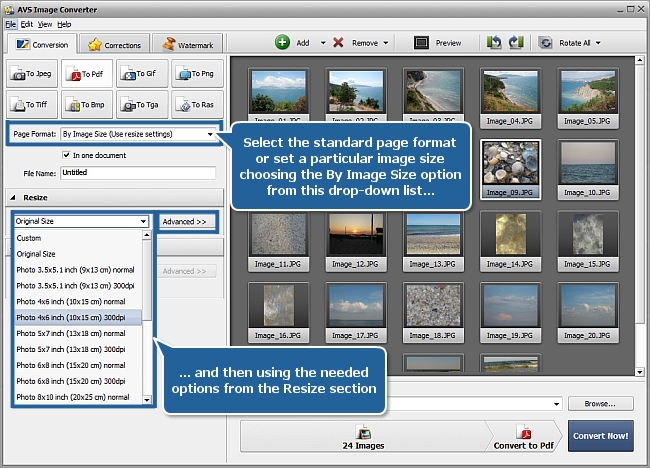 If you choose this option the Resize section of the Conversion tab will be available and you will be able to resize your images as you want. To do that you can use one of the available presets from the drop-down list in the Resize section or click the Advanced >> button to set a particular size manually. To learn more about the resize options you can refer to our Online Help section. The In one document option is checked by default. Don't uncheck it if you need to merge all the images into a single multipage file. Then type the output file name in the File Name field (in this case the Rename section of the Conversion tab will be disabled). 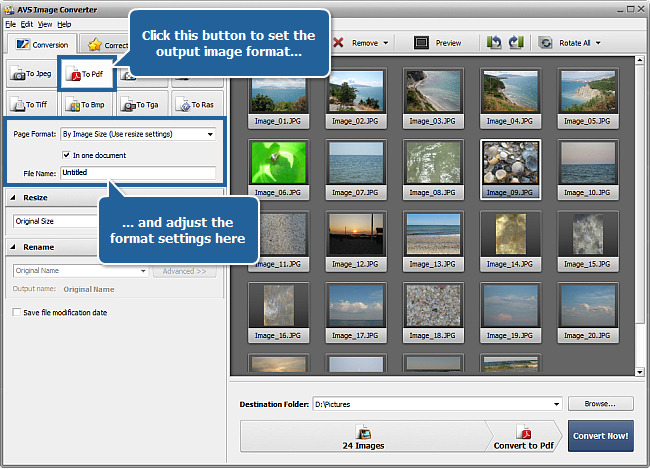 Note: if you deselect this option, then each image will be saved as a separate Pdf file. You can also apply some effects to your images before converting them. To perform this task see the instructions here. If you want to protect your copyrights or insert some comments to your photos you can add text or image watermark to them. Follow the steps here to learn more on how to do that. Assign an output folder for the resulting files. To do that select one of the folders from the Destination Folder drop-down list. If you want to specify your own folder press the Browse... button. In the opened window browse for the desired directory or create a new one and press the OK button. Note: if you have not checked the In one document option at Step 3, then the Rename section of the Working Area will be available. 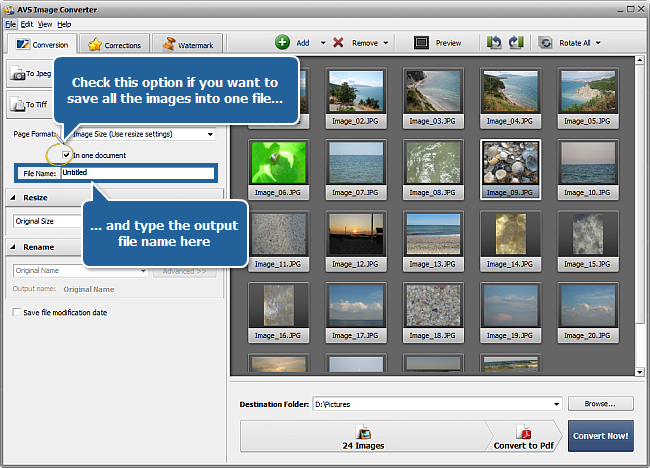 In this case you can change the output name of your image files by choosing the desired preset from the drop-down list or create a new preset by clicking the Advanced >> button. That's all! 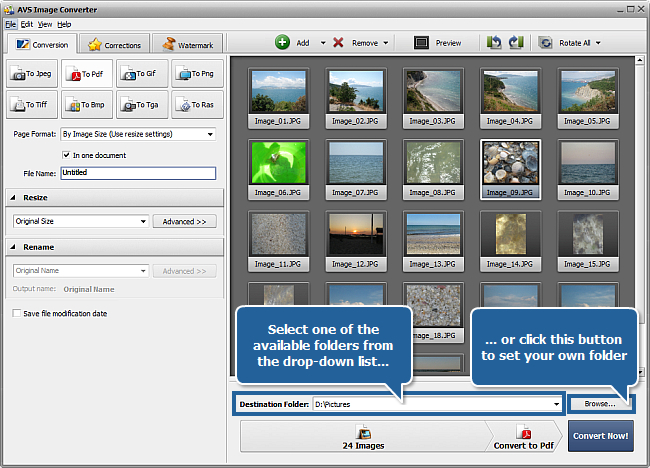 The converted images can be found in the destination folder. You can use them according to your needs.